To view the original article by Loren Steffy in the Houston Chronicle, click here! 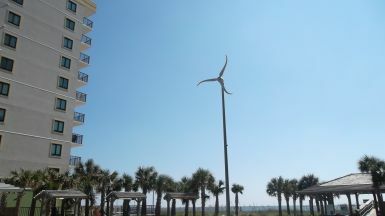 NORTH MYRTLE BEACH, S.C. – The breeze blows gently off the Atlantic, yet the turbine stands unmoving, a reminder of what could be. Nestled among the high-rise hotels that dot the shoreline here, a handful of 12-foot turbines look more like seaside artwork than a serious attempt at alternative energy. They only spin when the wind reaches 8 miles an hour, and even then, their output is tiny. But they are the first step in an ambitious plan to diversify this coastal community’s economy, first by becoming a test bed for coastal wind technology and later by benefiting from it. “This city could be symbolically green-powered,” City Councilman Greg Duckworth said. This wasn’t the story I expected to find here. I was in the area to give a speech, and I thought I might write about prospect of offshore drilling on the East Coast. Instead, I found the hottest local energy story is coastal wind. Unlike Texas, where wind has become big business both on the plains near Sweetwater and in coastal regions south of Corpus Christi, the efforts here are being done using a smaller, more localized approach. Duckworth knows that wind energy won’t meet all the city’s power needs, but if the project reaches full capacity, it could meet a substantial portion of local demand. 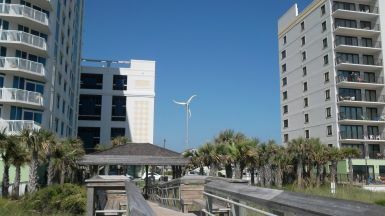 As a first step, North Myrtle Beach declared itself a “demonstration city” to encourage wind energy developers to come here. Next, it hopes to convince residents that offshore wind power will benefit the community rather than blemish the horizon and scare away the tourists on whom the local economy depends. “If you can get used to that at your beach boardwalk, you can handle a turbine 10 miles out,” said Monroe Baldwin, chairman of the local chamber of commerce’s economic development council. It may be working. Many residents responding to a local study expressed support for the project. The city already has a substation that could handle the influx of 332 megawatts from offshore without any upgrades. That’s more energy than the city typically uses, Baldwin said. The big questions that dog wind power everywhere, of course, remain. How much will it cost, and how reliable will it be? Santee Cooper, the local utility involved in the project, estimates wind-generated electricity will cost between 12 cents and 16 cents a kilowatt-hour, as much as twice the statewide average of about 8.8 cents last year, according to the U.S. Energy Information Administration. South Carolina’s cheap power – its average electricity prices were lower than Texas’s 9 cents a kilowatt-hour and the national average of 9.9 cents – makes it difficult to compete with conventional power, which is mostly generated from burning coal. “If we had Northeast power costs, we’d be there already,” said Paul Gayes, a professor of marine science and geology at Coastal Carolina University in nearby Conway. The project, though, is about more than simply saving on electric bills, Baldwin said. 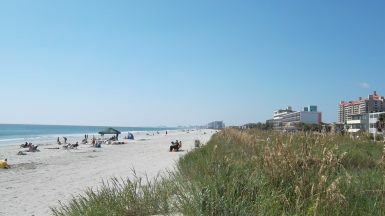 He sees coastal wind as a way to make residents feel more self-sufficient in a town dependent on tourism and fishing. “Spending a little more on something that stays here is different than sending money out of town with every power bill,” he said. Sometimes with alternative energy, smaller works better. Solar panels on rooftops, for example, are typically more economical than large, expensive solar farms. Here, the community role in the project can’t be overstated. In Texas, where we famously think big, there may be a lesson in the community-based approach to wind power on display here. The project avoids one of the costliest aspects of West Texas’ wind farms – building the multi- billion-dollar transmission lines, at taxpayer expense, to bring the power east where it’s needed. There may be economic benefits, too. A Clemson University study this year found the project would generate almost $2 billion in wages and $620 million in state and local revenue during the project’s 10-year construction period. Of course, with Congress threatening to allow federal wind energy subsidies to lapse at year’s end, no one knows how that will affect the project’s viability. Gayes said he expects the development to move forward, even without the subsidies because the companies involved already have a lot invested. For now, though, the program remains in its infancy, with the beach-side turbines rising as a symbol of the future for a coastal town battling against the power of the past.